Rampaging guar! 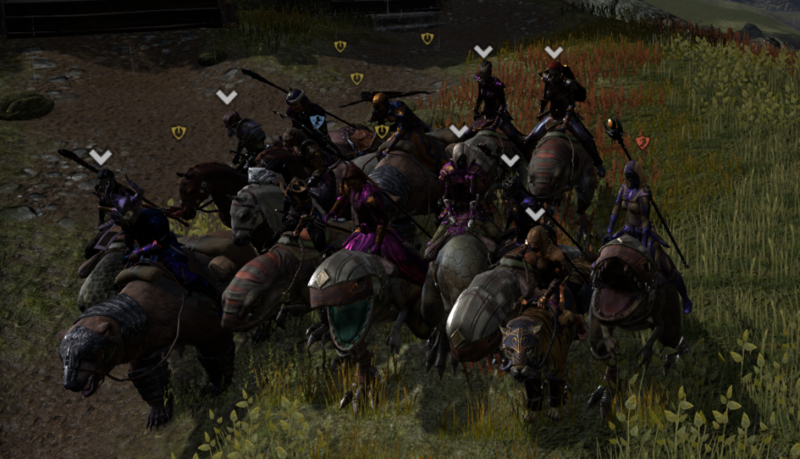 Falanu Dren, my Dunmer Templar, is riding the very happy-looking guar on the right. I… did very little productive this vacation. I am okay with this! This is what vacation is for. I did, however, get back into ESO, and play a lot of that with my wonderful guild(s). With Falanu, my main, I hit V12, finished Cadwell’s Silver (wicked overleveled, I know), and started Cadwell’s Gold. Currently Matt and I are blowing through Auridon, doing only the stuff we need to fill out the Almanac, not even reading the quests because I’ve done this zone twice before. Surprisingly, Matt With the Hat (a.k.a. Matt who is not my husband) started playing last week! We suggested he make a Daggerfall Covenant character to pair with our as-of-yet unplayed DC characters, my Imperial Dragonknight, Corvus Duronius, and Matt’s Breton Templar, Ogier Montrose. He obliged, and so the Redguard Nightblade Nasir al-Qiteb has joined us. We tooled around Stros M’Kai and Betnikh together and did the public dungeon in Glenumbra (Bad Man’s Hallows); last night we did the trio of lowbie dungeons (Spindleclutch, Fungal Grotto, and Banished Cells). Mostly I have been running a lot of dungeons, both normal and veteran, pledges and otherwise, with the UESP guild — in particular, a core of @Faunter, @Lurlock, @Sedrethi, @Deandra, @baratron, and @Wicked_Shifty. There was one day where I ran seven! (“Somebody get this couple some marital counseling, before Nerien’eth kills us all,” I may have said). (Also after we had killed Nerien’eth and found his shrine to Mephala, Falanu, Brelyna, and Sedrethi all started doing the /kowtow emote in front of it. “Sorry, the Dunmer were having a Moment,” we told Shifty, the only non-Dunmer among us). More impressive was vet City of Ash — where we realized, before the first boss, that since we hadn’t used LFG, Matt and I weren’t battle-leveled to V16. Somehow we mucked our way through, although there were a number of deaths along the way, especially to the final boss. That we made it through at all is more a credit to Deandra and Sedrethi’s DPS than Matt’s tanking or my healing. And deadly pie, of course. – Imperial City Prison (normal-mode — not touching vet until V16). When Matt K saw we were in there, he said, “I see you got yourself imprisoned for stealing. You need to try harder not to get caught.” We told him we were staging a breakout. – UESP hosted a GUAR RAMPAGE!!! Where we all dyed our armor purple and gold, met in Cyrodiil, tried not to accidentally kill folks not in our faction, and took screenshots and ran around the lake on our guar mounts. Others went on to explore some of the PvE content in Cyrodiil, though I didn’t join them. Also when I logged on with my Khajiit into a group we were both in, he unleashed his Dunmer xenophobia, calling Bri all kinds of Dunmeris insults (s’wit, fetcher, n’wah, etc). (I, alas, lack in my Khajiiti insults. In retrospect I should have called him “muskarse shaveskin”). – As always, being in a guild with people who know the lore insanely well is delightful. There’s griping in gchat about the guild called “Nine Divines Trading” (“Talos hasn’t even been born yet!”). When Deandra first met Falanu she said, “At least you’re not Falanu Hlaalu.” T’other night in TS we were discussing the trippier lore books, like the Remanada and the 36 Lessons of Vivec. (Oh, Michael Kirkbride. You’re so special).